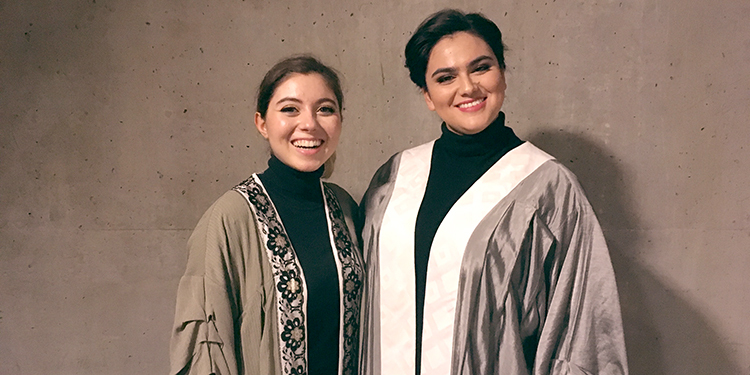 Two Richmond residents, Marina Agasian (left) Roshaan Saulnier (right) in Mozart's famous opera, The Magic Flute, presented by the UBC School of Music. Marina Agasian and Roshaan Saulnier appeared in the University of British Columbia's School of Music's performances of Mozart's famous opera. This major work ran from Jan. 31 through Feb. 3 at the Chan Centre. This opera, in continuous production for 200 years, surprised me with its humour. It was beautiful and funny and grand. I don't enjoy opera on TV, the radio or in recordings. I enjoyed this, immensely. Agasian grew up in what she calls "the Costco area" going to R.J. Tait Elementary then Cambie Secondary before moving to Matthew McNair Secondary's mini school incentive program. It was in her high school years that Agasian found her voice and her love of opera. "I'd say my biggest influence was my voice teacher during high school, Diane King. We started with classical training in terms of technique, and opera seemed the natural way to go in terms of the repertoire we worked on," Agasian says. Saulnier grew up in Steveston going to Alfred B. Dixon and then to R. A. McMath for French immersion in Grade 8. She credits her high school drama teacher, Joel Garner, for giving her a love of teaching: "Mr. Garner really inspired me to really pursue teaching and being an actor. It really helped me find my confidence." Saulnier also mention her Grade 11 English teacher: "Mr. Track had such passion for our Shakespeare unit, "Macbeth". His love and passion was infectious. It caused me to pursue more drama training after high school." Her love of singing started early she says: "I was in the Richmond Youth Honour Choir at age 10 and 11. We did some cool things; we went to Ottawa for Canada Day. We were part of a 500-voice choir on Parliament Hill." The two young women grew up knowing each other. "I went to Richmond Academy of Dance with Marina. It's where I did my voice training and danced there for years and years," Saulnier says. In her third year at the UBC School of Music as an opera student, Agasian speaks of her participation in the performances: "I'm in a few different roles. I'm a chorus member, and then I'm also a bird lady, then six other small animal roles. I and a bunch of other kids are enchanted when Tamino starts playing the flute." She says: "It's cool. I feel like it's not one solo role. I have a few so it's like a fishing expedition throughout the whole opera. I get to experience the whole plot throughout the opera, although I do have a lot of costume changes so I have to be really on top of timing and the music." She also pitches in before the performance each day. "For this opera I might be doing the 50-50 draw in the lobby. I go around selling tickets to then give half of the profit towards the program." She also mentions the upcoming Opera Ball. That also raises funds towards the opera program. "It's the big (March 1) event we host each year with dinner, music and a silent auction," Agasian says. To help defray her education costs, Agasian teaches at the VSO School of Music and also works as a server at the L. A. Grill at Blundell Centre. "The LA Grill is a nice small place and you can get really good meals for a good price. There are a lot of regulars because they like the food there," she says. Saulnier performs throughout the summer, honing her acting skills in musical theatre. She was in Theatre Under the Stars two years ago in "The Lazy Chaperone." This summer, she will be in "Momma Mia" appearing every other night in the ensemble. Saulnier is thrilled. "Last year, I watched that movie once a week with my roommate. We loved all the songs. There is so much joy. And, who doesn't love ABBA?" she says. She says her acting has helps in her classical singing career: "Opera is the biggest drama that you imagine." She explains the name of the recent UBC Opera: "'The Magic Flute' is what Tamino is given by the Queen of the Night and it guides him through his quest for love, accompanied by some whimsical friends. There's the Queen of the Night's famous aria. There's no way you haven't heard this piece." In her second year, Saulnier says, "I'm in the chorus, the ensemble, in a very Motzartian fashion, the chorus comes in right at the end of both acts. At the end of Act one when Tamino is about to go off on his trials to earn Pamina's hand, the chorus comes in to sing about his triumph. Then (spoiler alert) again, at the end of Act two, when the queen has been defeated and everyone's in love. It's a very Mozart turn, with a very triumphant chorus and all is happy." Saulnier is enjoying her program at UBC: "I really like being able to do these shows and that's one of the great things about the program at UBC; we do three full operas a year." She says she is thrilled to be doing such a favourite so soon in her career: "'The Magic Flute' is a delight. To see upper classmates doing these (leading) roles and these amazingly epic choruses. It feels like this, this is what I was waiting to do!" "I want to be in these famous operas that you hear stories about growing up and being in one my favourites so early in my career I feel very lucky," she says. Agasian says of this Mozart piece, "I think that it's a very good first opera for people who might not go regularly because it has such a whimsical story line, as well as all the costumes and the set. It's just really pleasant to watch. It's a good opera for people who might be intimidated by opera. It's good to go and try watching it." She speaks of the venue as well, "The Chan Centre is very beautiful. The sound is definitely rings a lot more than when we rehearse in the UBC Old Auditorium and that transition is always exciting to get to hear." "You don't think of opera as still being an industry that is living and thriving, but it is," Salnier says, "It's cool to be good at something that is unusual." The good news is this was a fabulous production with the music, staging, sets, outstanding costumes and most of all, the singing all of a professional quality. My companion said the German accents were good, with that of the Birdcatcher being the best. She loved the production. As a regular opera-goer in Berlin, she knows quality when she sees it. This was a quality production from top to bottom. That's the good news. The bad news is that you will have to wait until June for the next UBC Opera major production. Even if opera on records, the radio or TV is not your thing, I would encourage you to give this a try. It is the total spectacle that draws you into the humour and the pathos that is opera, the musical theatre of Mozart's time. To book tickets for UBC opera’s next major performance, "Don Giovanni", which opens June 20 and runs through June 23 call 604-822-6725 or click for tickets.